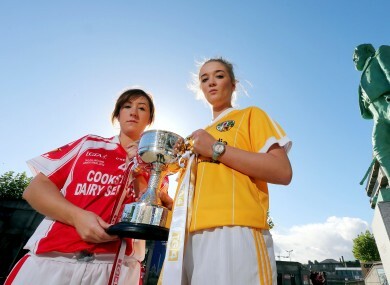 It’s Louth and Antrim who get the ball rolling in Sunday’s TG4 All-Ireland Ladies Football finals. Aine Magee of Louth with Anna Finnegan of Antrim who contest the Junior Final. IT WILL BE an early start for the ladies footballers of Louth and Antrim on Sunday as they clash in the TG4 All-Ireland junior final in Croke Park with a 12 noon throw-in time. Of course, had it not been for a draw in the All-Ireland hurling final at the start of September, the three ladies finals would have been played in their original slot of last Sunday. While the extra week’s wait is not ideal, Louth manager John Hanratty accepts that everybody is in the same boat. This game will be the third meeting of the sides, with one win apiece from the previous two games. “We played them in the first round of the league up in Antrim and they beat us by a point that day,” Hanratty says. “Then we met them again in the quarter-finals and we came out the stronger, we won by nine points, it was a game that could have gone either way. It was a drawn match with five minutes to go and we had had three players sin-binned in the second half but we got two late goals. In his second year in charge, Hanratty is delighted with how everything has come together as the progress of the last campaign has been built upon. “I took over at the start of 2011, and my biggest job was trying to get the confidence back. About six or eight of the girls had retired, so I had to try and convince them that they were good enough to get back to Croke Park. Louth are also helped by the fact that playing in Croke Park is not a new experience for a lot of the side. One of the newer members of the Ulster side is Anna Finnegan, and it will be her first time to grace the Croker turf. Acknowledging that the previous meetings will not have a bearing, she is delighted with the prospect of playing at GAA headquarters. Email “Wee County boss Hanratty set for Saffron battle”. Feedback on “Wee County boss Hanratty set for Saffron battle”.